Keys are sharp little things and mine were digging into my leg when I carried them in my pocket. They probably weren’t doing the linings of my handbags much good either. The quick fix solution? 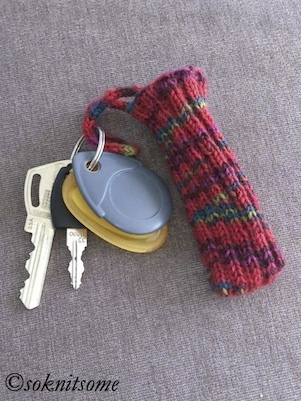 A simple tube sock with an i-cord to keep the keys and sock together. I used Cat Bordhi’s version of Judy Becker’s Stretchy Cast-On. I use this for toe-up socks but here I cast on the total number of stitches straightaway. The start is a little fiddly on DPNs but nothing too tricky. The tube is a good half-inch longer than my keys and the stretchy two-by-two ribbing pulls the top in over the keys. Since I have a bit of a reputation for being a knitter, this seemed like the ideal way of giving some of my close friends in Cologne a little leaving present that was ‘the same but different’ without worrying about size or fibre preferences. I made one earlier this year for an old (longstanding) friend down south. It’s perfect for sunglasses, keys and purse but it can always just be used for keeping things tidy in a cupboard. This pattern is Summer Fling by espace tricot and you can find it on espace tricot’s wonderful website here and on Ravelry here. I was pleased to finally add a bit to my knitting mileage for this year (1.376m = 0.855 miles! ), since once you put Knitmeter on your blog, you feel a bit silly if the numbers don’t change! Needless to say, this simple pleasure is dampened by the fact that I’d much rather not have had any reason for knitting farewell gifts! Sometimes you can’t get enough of a good thing. This little bag was made for Elder Daughter’s birthday. She lives in Munich (575 km away from Cologne) so I was pleased to have something light to add to a parcel. It’s a Summer Fling. The pattern is by espace tricot and you can find it on espace tricot’s wonderful website here and on Ravelry here. A big thank you to everyone who indicated their favourite colour combinations for the Summer Fling bag featured in my previous post. There were a total of 48 votes: number 1 is the raspberry and beige combination (11 votes) followed by olive and beige (10 votes). Raspberry and olive and lime and beige tie close behind in third position (9 votes each). I also shared the post on my personal Facebook page and many people commented on their colour preferences: raspberry and olive and raspberry and lime were the two favourite combinations. Raspberry and beige was less popular as was lime and beige. So which colour combination am I knitting? Colour conundrum – please help! I’m going to make (at least) one of these lovely bags. It’s called Summer Fling and you can find it here on the Espace Tricot blog.